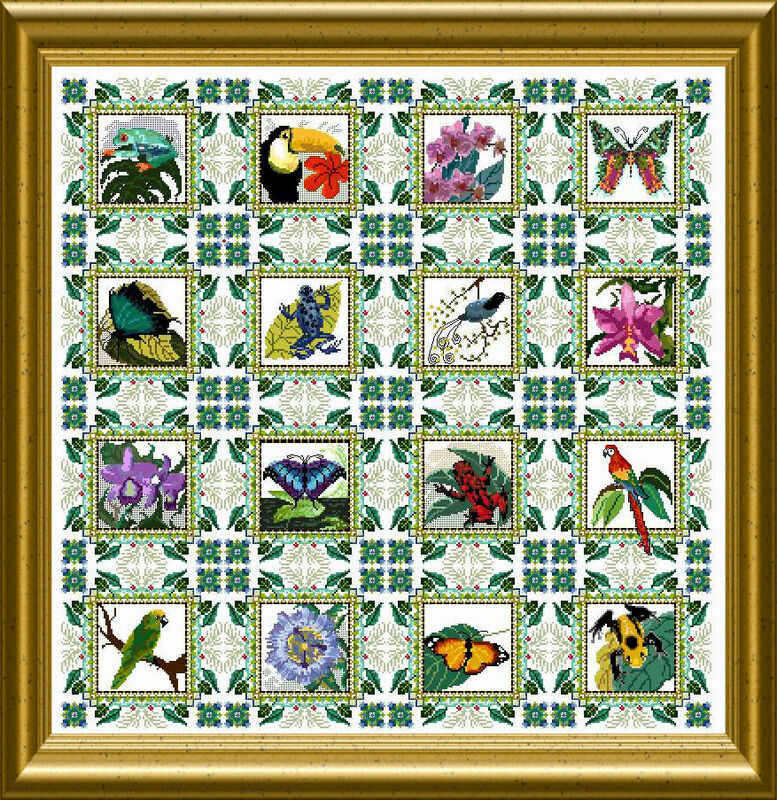 This one is an “all-in-one” package , themed “RAINFOREST” – all about plants, insects, birds and other inhabitants of these colorful regions of the earth. 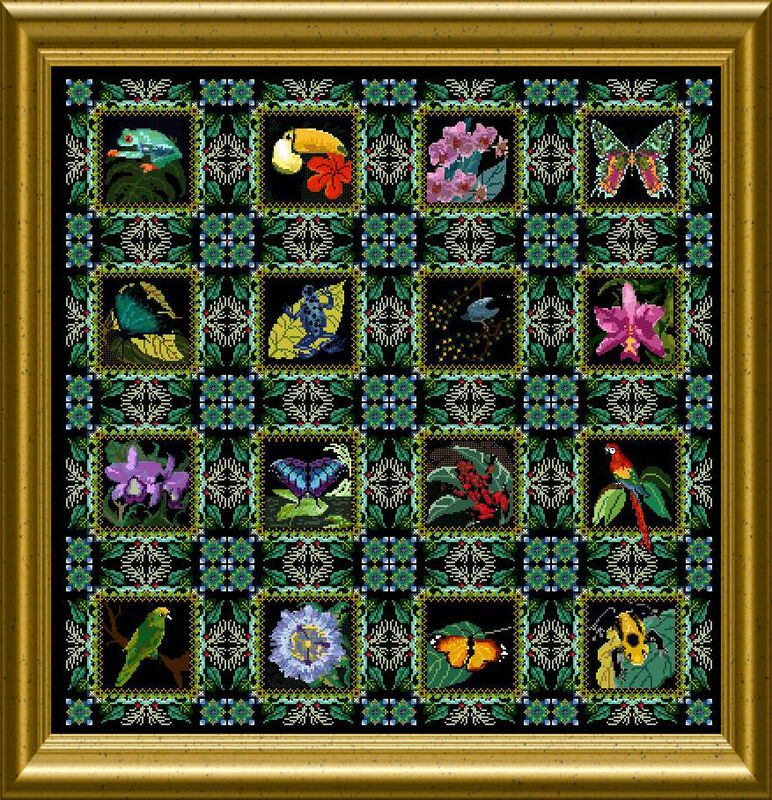 You can stitch them all together on one piece of fabric for an impressive work of embroidery with a celtic background, which can be personalized by the added alphabet…. Or – and this was the basic idea, you can use each ready stitched small design, surround it with patchworked fabric pieces, in Log-Cabin style or other – and sew a beautiful heirloom piece – a Quilt ! 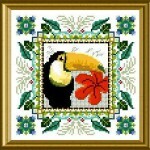 Each single motif with the frame is 91 x 91 stitches – you will have to add the free fabric to your own requirements. 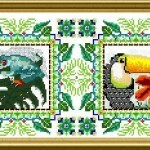 367 x 367 stitches – more or less, depending on the free space between the single squares and rows. 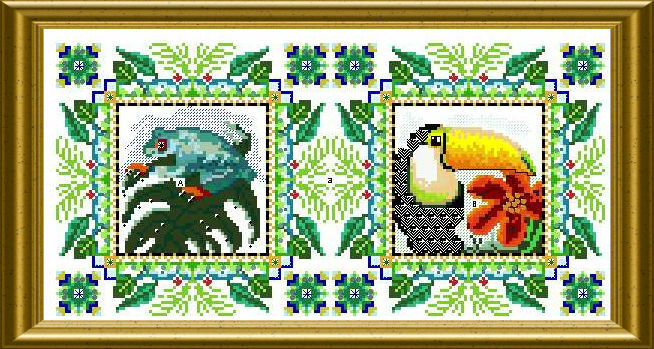 Do not forget to add the free fabric for an outer area ! I’m actually more interested in just the frogs. I have a project in mind for a friend. Sorry, Dann – the motifs are not available single at the moment. Hello, Martina! I fell in love with your designs, try to decide – which to start with.. 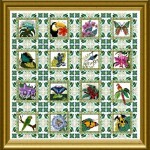 I like rose & butterfly quilt, and found kit of threads on the site, but can’t find pattern here. What I have to do? Where I can find pattern? Thank you! Hi Olena, I am sorry, but the Rose Quilt is still in the “queue” of old designs which need to be worked over and republished. It will come surely this year.